COOPER, Iowa, March 27, 2017 — The Greene County Historical Society begins its monthly meetings for 2017 on Friday, April 7, at the United Methodist Church in Cooper. The program will be “90 Years of Local History in 45 Minutes,” with journalist Chuck Offenburger moderating the discussion with three Cooperites who are all 91 years old and are great storytellers – Stephen Molle, Willard Hostetler and Bob Burnell. An $8 lunch will be offered at 12 noon in the church basement, and historical society members should RSVP to their community contacts by Wednesday, April 5. Lunch for non-members is available, too, for $10 and they can RSVP by calling vice-president Nancy Hanaman at (515) 436-7684. The program at 1 p.m. in the church sanctuary is free. “The idea for this program developed almost two years ago when I was curious about a couple points of local history, ran into Stephen Molle and Bob Burnell at different times, asked and they knew the answers,” Offenburger said. “Then I attended Willard Hostetler’s 90th birthday party, and most of the people there were shocked that he was 90 because he’s so active and sharp. All that reminded me what a blessing it is to have people of their age around who can still give us first-person, eye-witness accounts of things that happened here decades ago. Left to right are Stephen Molle, Willard Hostetler and Bob Burnell. The three have known each other most of their lives. Molle, who graduated from Franklin Township High School in Cooper in 1944, has lived his whole life on the farms where he is now, three miles south of Cooper. Hostetler went to school through the 8th grade, graduating from a country school east of Panora in Guthrie County. He was the oldest of six children, for whom he became primary caretaker. His family moved often around Guthrie and Greene County, working as hired hands on farms. He rented land, settled and began farming just west of Cooper in 1944, and now lives between Cooper and Jefferson. Burnell graduated from Bayard High School in 1945, farmed in the Greenbrier neighborhood, went into business building grain bins, and now lives in Jefferson. 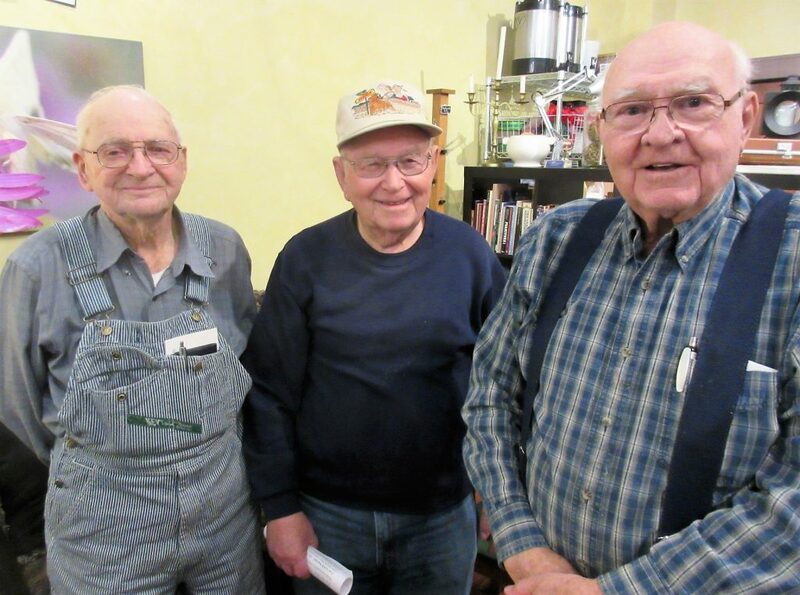 When the three men got together recently to go over some stories, they began by talking about their childhood in the Great Depression of the 1930s, when their families grew their own food, and shared homemade clothes. The big outing of the week was going to Jefferson on Saturday night to sell their eggs & cream and buy groceries. They’ve seen so many changes. For example, they recall that the main road from Jefferson to Panora was a gravel road called Highway 150. It left southeast Jefferson by passing under what today is known as “Graffiti Bridge,” and followed the route of today’s P Avenue, passing east of Cooper, Herndon and Yale. It was nicknamed “the Jefferson-Panora Speedway,” all recall. What was the biggest change in their lives? “Had to be getting electricity and indoor plumbing,” said Hostetler. Most rural homes in Greene County were getting it in the 1940s. The three were tasked with thinking about three special topics for the program: 1) people and events that are almost forgotten today but that should be remembered, 2) who the county’s “biggest characters” have been, and 3) what their individual hopes are for Greene County and its people in the future.